Several Northeastern Wisconsin residents were among those who had millions of dollars stolen by investors to fund a lavish New York lifestyle, according to their attorney. The local investors — some of them elderly people who risked significant parts of their life savings for what was billed as quality retirement income — were among more than 500 people nationwide who paid a Boston investment firm for ownership stakes in properties including Green Bay’s East Town Mall. Most of the local investors lost more than $200,000, but some may have lost more than $500,000, the attorney said. They no longer have a stake in the property, which is being run by a Chicago firm appointed by a court. Massachusetts Secretary of State William Galvin this week filed fraud charges against the firm and its principals, Carlton P. Cabot and Timothy J. Kroll, The Boston Globe reported. Galvin’s complaint says the men “artfully fabricated an air of prominence for their firm” to attract investors, but then diverted at least $9 million into their own accounts while allocating little to the real-estate deals. The money was used to “bankroll their lavish lifestyle in Manhattan,” Galvin’s complaint said. 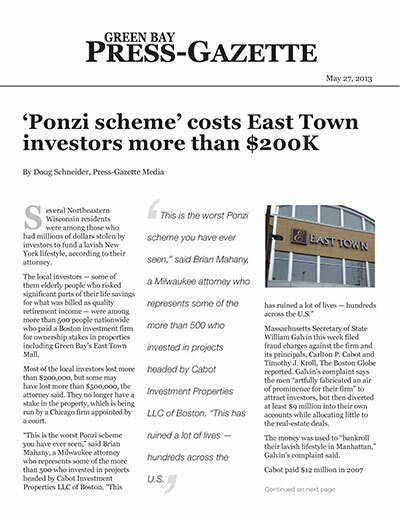 Cabot paid $12 million in 2007 to buy East Town, a 32-year-old complex on 21 acres of land at 2530 East Mason St. A claim filed on behalf of the 27 East Town investors said Cabot began embezzling funds in 2010, defaulted on loans in 2011 and waited months to notify investors. After the default, Mahany said, investors were shocked to learn that they could be held personally liable. Most of the investors paid $213,000 for a 3 percent ownership stake, court papers show. Court papers identify them only as “Cabot East Town LLCs 2-27” — the names of the limited-liability corporations formed when shares of the mall were sold. Mahany said he was prohibited from identifying them by name. Nationally, more than 500 people invested a total of $253 million in 18 of Cabot’s commercial properties. In Massachusetts, The Globe reports, 14 investors plowed more than $5 million into Cabot deals. It’s unclear how much — or any — of the investors’ lost money can be recovered. Kroll and Cabot Investment Properties did not respond to subpoenas from the Massachusetts attorney general, the firm’s website is inactive, and court papers filed in Brown County say Carlton Cabot cannot be found. As East Town’s legal issues are being sorted out, the mall is being operated in receivership, a court-ordered variation on bankruptcy in which a judge appoints an outside party to control a distressed property. Sylvia Payette, vice president of property management for the receivership firm, Jones Lang LaSalle of Chicago, said the court cases are not affecting the operation of East Town. “We plan to continue to operate the mall as a vibrant asset to the community,” she said. The mall has held steady at almost 20 tenants recently, though an agent for the receiver last year sought a reduction in the mall’s tax assessment, saying revenues have declined now that the mall is more than 30 years old. East Town has 18 tenants, including a cinema. Major tenants are Hobby Lobby, Office Max, Kohl’s and Petco.